A play about nuclear arms negotiations in the 1980s should be a dated piece of interest only to historians of theatre, and perhaps, of nuclear strategy. Lee Blessing’s “A Walk in the Woods” is as relevant today as it was when it was written almost 30 years ago, though. For one thing, our world hasn’t grown out of nuclear threats, a disappointment felt heavily by those of us who thought the end of the Cold War might mean something better. More importantly, though, Blessing’s script isn’t about throw-weights, megadeaths, SLCMs, ICBMs, Pershing IIs and SS-20s (I’ll spare you the definitions, but I got an A in the relevant courses). It’s about finding a human connection in a difficult situation. 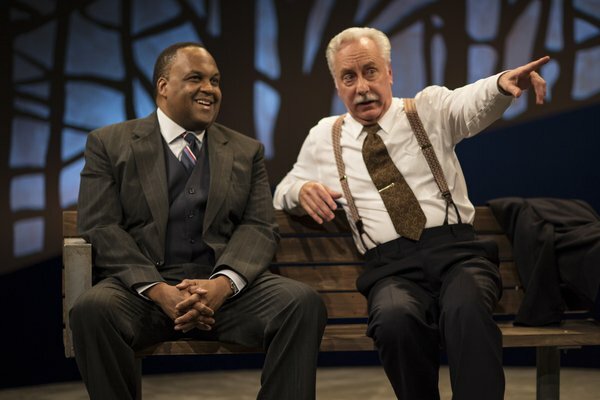 K. Lorrel Manning and Martin Van Treuren in “A Walk in the Woods.” Photo Courtesy of the Barrow Group.
) chat about the new American proposal, the nature of their nations, favorite colors and catching rabbits. In short, they talk like two colleagues, but Botvinnik has long given up on achieving anything meaningful and wants to make a friend. Honeyman, with the enthusiasm of all new kids, seeks a breakthrough, after which, maybe they could be friends. As summer turns to autumn, then winter and spring, their relationship clearly deepens despite what Honeyman says. Blessing’s script is salted with laughs here and there, but largely, it lets two serious actors play out the seriousness of the human condition. Manning and Van Treuren have subtle roles to play; indeed, there is only one real outburst of emotion. The rest of the time, they are simply men past middle age sitting on a bench in the woods. The roles are difficult because they don’t seem to call upon any great well of experience or emotion. Rather, the actors are asked for a bureaucrats’ verisimilitude while at the same time not boring the audience. That requires a chemistry that Manning and Van Treuren have in copious amounts. Director Donna Jean Fogel has found a way to let that chemistry flow into the audience, and the set is simple so as not to detract from the words and the actors. This is the kind of theatrical elegance one used to see on “Westinghouse Playhouse” or “Hallmark’s Hall of Fame,” but which is always a thrill to encounter. The Barrow Group likes to throw in some spontaneity to the script to give the audience greater immediacy. The performance I attended was spontaneously interrupted about 15 minutes in by the fire alarm, and we had to head outside. The FDNY had already arrived, and they quickly gave the all clear. Back inside, Manning and Van Treuren returned to the same spot in the script as if nothing had happened. It was consummate professionalism from the ushers and staff to the men on stage. The Barrow Group is concluding its 2017-18 season with this production, preceding it with “Muswell Hill” and “The Thing with Feathers.” Based on the reviews this site has done, it’s been one of their artistically most successful seasons, although the decision to revive “A Walk in the Woods” struck me as rather courageous (foolish?) when I first heard of it. It turns out that the season is ending on an incredibly high note here, and the only downside to it all is that the play ends April 15, which is all too soon. Running Time: 2 hours including a 15-minute intermission. For tickets and information, visit The Barrow Group’s website.